On January 3, Dr. Alan Hurwitz, President of Gallaudet University, appointed Dr. Angela McCaskill Deputy to the President and Associate Provost of Diversity and Inclusion. She is a well-known figure in the Deaf Community, having worked at Gallaudet as a teacher, administrator, and leader for 23 years. 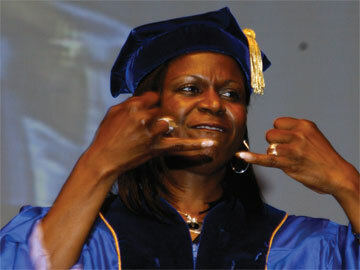 She made history on May 14, 2004, when she became the first African-American alumna of Gallaudet to earn a Ph.D. Her older sister, Carolyn, became the second one the following year. Both doctorates were in Special Education Administration. I grew up in Mobile, Alabama. My parents were Willie McPherson (deceased) and Janie McCaskill, currently living in Mobile—both hearing. They never married; basically, I grew up in a single-parent household. I have three sisters and one brother. The first three are deaf and the last two are hearing. My oldest sister, Carolyn, is deaf and was the first Black Deaf Miss Gallaudet in 1976. She is a professor in the Department of ASL & Deaf Studies at Gallaudet and resides in Largo, Maryland. Jacqueline, who is also deaf, graduated from Gallaudet in 1978 and currently lives in Mobile. I am the third sibling and I am hard-of-hearing. My youngest sister, Sharrell, is hearing and currently works as the Equal Employment Opportunities (EEO) Officer at Gallaudet. My brother is the last sibling, also hearing, and currently resides in Mobile. I graduated from Davidson High in May 1976 and immediately enrolled at Alabama State University during the summer. In May 1980, I received my Bachelor of Science Degree [in Social Work]. I was very active at ASU. I ran track, played on the softball team, and was a cheerleader. My experience at ASU was the best days of my life. I moved to Washington, D.C. in 1980, immediately after graduating from ASU, and moved in with Carolyn. This was the beginning of a new era for me. I grew as a person when I became immersed in Deaf culture and the Deaf world. It has been my life since. I love it! Even though I have two Deaf sisters, I didn’t know American Sign Language growing up. I was fluent with the manual alphabet. I begin to learn ASL and made many new deaf friends. Ruth Reed and Pamela Baldwin were the two deaf friends that I met upon arrival in Washington. They took me under their wings and taught me ASL. I am forever grateful for their friendship and support, and we remain friends to this day, 31 years later! After arriving in D.C., I was hired to work at the Model Secondary School for the Deaf. I worked at a variety of positions at Gallaudet as Assistant Principal, Program Manager, Coordinator of Residence Education and Academic Advisor, and several others. All helped me to grow as a higher-education professional. In August 1981, I enrolled in the Social Work program at Howard University and graduated in May 1984 with a Master of Social Work degree. After earning my MSW, I immediately began taking classes towards a doctoral degree. I took one class here and there and increased the number of classes over time. I also married and had two sons. My marriage ended when they were ages 2 and 3, so that slowed my progress towards working on my Ph.D. It took me 10 years to finish, but I graced the stage in May 2004! What matters most is not how long it took me to finish my degree, but that I completed it, considering all the things I was juggling. I worked for the U.S. Department of Education from 2000 to 2007. My primary charge was to oversee the States’ implementation of the Individuals with Disabilities Education Act (IDEA). During my tenure there, I did not oversee the full No Child Left Behind Act. I did monitor a portion of it as it related to deaf children. The goal was to ensure that all children with disabilities, including deaf children, participated in district-wide and statewide assessments, which I supported. Schools were reluctant to [comply with] this because they believed that not just deaf children but children with disabilities lowered their Adequate Yearly Progress (AYP). I was charged with making sure the schools were in compliance with the law. I think my role there helped from having a Deaf person’s perspective and understanding the importance for schools to meet the educational needs of Deaf and hard-of-hearing children and to ensure that whatever accommodations provided during the classroom instructions were also provided during the district-wide and state-wide assessments. Today, Deaf children of color have better opportunities to achieve their education. There are more role models for Deaf children of color to emulate. It is critical that schools provide the tools for them because the world is becoming smaller and more globalized. Deaf and hard-of-hearing adults have to pass the torch to Deaf children of color. The future is theirs. In the not-so-distant future, I envision seeing an increase in the number of Deaf people of color as lawyers, politicians, administrators, teachers, faculty, authors, scientists, and even a university president! There are no limitations as to what they can achieve. I was the first African-American woman to receive a Ph.D. from Gallaudet University (2004) and Carolyn was the second (2005). Finally I would like to add that if you can conceive it, you can achieve it. It takes faith, hard work, perseverance, and determination to visualize your dream.